Hibiscus, at early times it was the other name of lotus flower. Now it often refers to Cotton Rose(hibiscus mutabilis). Sometimes it represents the beautiful girl. 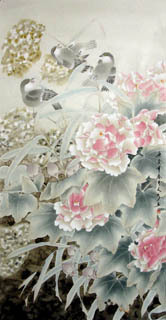 The most famous type of cotton rose is "Drunk cotton rose(三醉芙蓉)", as its color is white in the morning, then pink at the noon, and red in the evening. It's very precious. Hibiscus symbolizes precocity, chastity, beauty, unsullied characters etc. 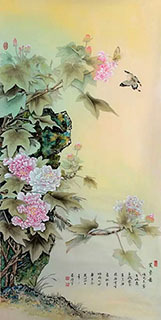 Chinese Peony & Cotton Rose Fengshui Painting: Rong Hua Fu Gui(荣华富贵). 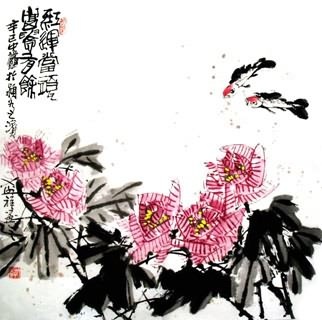 In Chinese, "ibiscus(芙蓉)" Cotton Rose sounds like the word "wealth(富)" and "glory(荣)", "flower(花)" sounds like the word "magnificent(华)", and peony is known as a symbol of wealth and glory, so this combination symbolizes "the inexhaustible great wealth and glory". 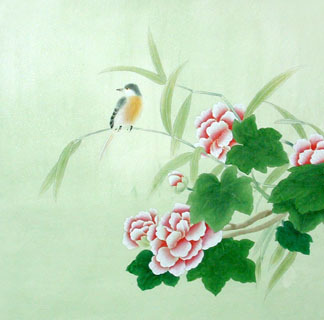 Chinese Sweet-scented Osmanthus & Cotton Rose Feng Shui Painting: Fu Gui Qi Rong(夫贵妻荣). 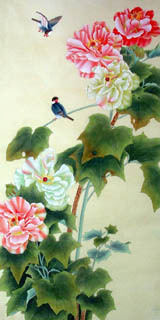 As "hibiscus(芙蓉)" Cotton Rose sounds like the word "husband(夫)" and "glory(荣)" in Chinese, and "sweet-scented osmanthus(桂)" sounds the same as that of "nobility(贵)", so this combination symbolizes the couple share the glory and nobility, and they are inseparable lovers forever. 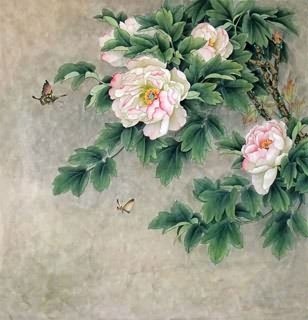 Chinese Cotton Rose & Other Eight(8) Flowers Feng Shui Painting: Jiu Qiu Tong Qing(九秋同庆). The combination of ockscomb, hibiscus, begonia, chrysanthemum, sweet-scented osmanthus, orchid, pink, nandin and okra. They are all flowers in autumn. Autumn is the season when people have good harvest. The autumn fruits and flowers are the best symbols of good harvest. InkDance Price: USD 465 /GBP 382 /EUR 442 Sold, you can customize it. InkDance Price: USD 680 /GBP 558 /EUR 646 Sold, you can customize it.